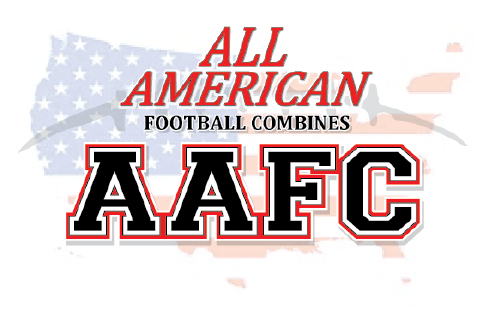 I HEREBY ASSUME ALL OF THE RISKS OF PARTICIPATING IN ANY/ALL ACTIVITIES ASSOCIATED WITH ALL AMERICAN YOUTH FOOTBALL LEAGUE (AAYFL) and ALL AMERICAN FOOTBALL COMBINES (AAFC), including by way of example and not limitation, any risks that may arise from negligence or carelessness on the part of the persons or entities being released, from dangerous or defective equipment or property owned, maintained, or controlled by them, or because of their possible liability without fault. I certify that my child is physically fit, has sufficiently prepared or trained for participation in the sport of football, and has not been advised to not participate by a qualified medical professional. I certify that there are no health-related reasons or problems which preclude my son’s participation in this activity. I acknowledge that this Accident Waiver and Release of Liability Form will be used by the event holders, sponsors, and organizers of the AAYFL or AAFC in which my child will participate, and that it will govern my child’s actions as well as mine, and responsibilities at said events/games. mentioned herein above from any and all liabilities or claims made as a result of participation in this activity, whether caused by the negligence of release or otherwise. I acknowledge that AAYFL and their directors, officers, volunteers, representatives, sponsors, activity holders, and agents are NOT responsible for the errors, omissions, acts, or failures to act of any party or entity conducting a specific activity on their behalf. I acknowledge that this sport may involve a test of a person's physical and mental limits and carries with it the potential for death, serious injury, and property loss. The risks include, but are not limited to, those caused by terrain, facilities, temperature, weather, condition of participants, equipment, vehicular traffic, lack of hydration, and actions of other people including, but not limited to, participants, volunteers, monitors, and/or producers of the activity. These risks are not only inherent to participants, but are also present for volunteers. I understand while participating in this activity, I or my child may be photographed. I agree to allow my photo, video, or film likeness to be used for any legitimate purpose by the activity holders, producers, sponsors, organizers, and assigns. I understand and allow my child to participate in a division higher than his own weight and age and I hereby agree to allow him to participate with children that may be older and weigh more than my child. I further understand that there may be consequences by allowing my child to participate and it could result in bodily injury. I hereby acknowledge and allow my child to participate with children older and heavier than he is and I hereby release AAYFL and AAFC from any liability resulting therefrom. I am of sound body and mind and hereby agree and allow my child to participate in the sport of football and all football events regardless of his age and weight restriction and hereby hold harmless AAYFL and AAFC from any liability therefrom resulting in injury or death to my child. I on behalf of my child, further assume all risk of personal injury, sickness, death, damage and expense as a result of participation in the sport of football, at practice, games or other events, involved therein. I CERTIFY THAT I HAVE READ THIS DOCUMENT AND I FULLY UNDERSTAND ITS CONTENT. I AM AWARE THAT THIS IS A RELEASE OF LIABILITY AND A CONTRACT AND I SIGN IT OF MY OWN FREE WILL. I ALSO CERTIFY THAT I HEREBY RELEASE AND WAIVE AAYFL and/or AAFC from any liability and GIVE UP MY RIGHTS and the rights of my SPOUSE from suing AAYFL and/or AAFC for any possible occurrences as stated herein. By Submitting this registration for the Kids Football training camp, I hereby agree to all waivers and releases contained herein. I, THE UNDERSIGNED, hereby forever grant my permission to ALL AMERICAN YOUTH FOOTBALL LEAGUE (AAYFL), licensees and producers or publishers of its promotional materials and their successors and assigns, the right to use, publish and copyright my picture and/or my child’s picture, portrait and likeness, in whole or part, including alterations, modifications, derivations and composites thereof, in advertising, educating and promotional materials for AAYFL and/or AAFC throughout the world any means of media or through the internet. This right shall include the right to combine my likeness with others and to alter my likeness, by digital means or otherwise, for the purposes set forth herein. I understand my picture and/or my child or children’s picture, portrait and likeness, will be used for commercial and/or non-commercial purposes.